superintendent John Latschar did what any responsible federal employee should do, said National Park Service Northeast Regional Director Dennis R. Reidenbach. He contacted National Park Service ethics officials, and he also contacted me as his supervisor. When initially informed by the Washington office in October 2008 that there was no ethical issue in accepting the position, Latschar announced his retirement. Subsequently, Department of Interior ethics officials issued supplemental guidance because of Latschars involvement in developing agreements between the Foundation and the NPS. "The Foundation obviously would have been honored to have John as its next president," said Foundation President Robert C. Wilburn. "But we are thrilled that he will continue to facilitate our successful partnership as superintendent of Gettysburg National Military Park." A search committee to find Wilburns successor is in place; Wilburn will postpone his departure from the Foundation until a successor is named. I had been looking forward to the challenges of moving to the private sector and working for the Gettysburg Foundation, said Superintendent John Latschar. However, I can't complain about going back to the best job in the National Park Service as Superintendent of Gettysburg NMP and Eisenhower NHS. We'll now redouble our efforts to make our wonderful partnership with the Gettysburg Foundation the best that the National Park Service has ever seen. The Gettysburg Foundations loss is the National Park Services gain, and I am happy that John chose to remain as superintendent, said Reidenbach. The situation with the ethics guidance was unfortunate, but John Latschar and the Gettysburg Foundation have always maintained the highest ethical standards possible. CWL: Certainly, it would have been a similar ethics violation to Obama's self-described 'bone headed' move of buying real estate from a (soone to be in prison) political fixer or like Tim Geitner's (now Secretary of the Treasury) failure to pay $34,000 in income taxes. Peace Light Probe Ongoing, Scot Andrew Pitzer, Gettysburg Times, Monday, January 26, 2009. 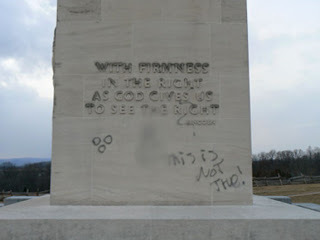 National Park Service investigators are teaming with area police departments to apprehend the vandals that defaced the popular Peace Light Memorial. Gettysburg Police Chief Joe Dougherty confirmed that his agency is working on a lead, but he was unable to release details, since the investigation is ongoing. “We’re working with other police departments to find links and other helpful information,” said Gettysburg National Military Park spokeswoman Katie Lawhon. Repairs to the Peace Light take precedence over other monuments, given the memorial’s popularity. “It’s definitely at a high-profile location,” said Lawhon. “We have so many monuments to take care of with normal maintenance and preservation, but this moves to the top.” Initially, park officials feared that they didn’t have the equipment to remove the graffiti. Lawhon indicated otherwise Thursday. “I think it’s a matter of power washing. We have that equipment,” she said. “We’ve taken paint and oil off monuments before.” The equipment, however, is uneffective in cold weather, so repairs will have to wait. There is no cost estimate for the repairs. “It’ll definitely be at a cost to the National Park Service,” said Lawhon. Hawk called upon veterans organizations to subsidize the repairs, possibly through fundraising. “The Park Service estimates that repair costs will be high, but it is our duty to ensure that the Peace Light shines on as a symbol of our national unity, especially in a time of national instability and war,” Hawk said. The $60,000 monument was dedicated July 3, 1938, on the 75th anniversary of the Battle of Gettysburg, representing unity between the the North and South. Dark-colored granite from Maine, a Union state, was used to construct the base of the monument, while the lighter colored shaft is made of Alabama limestone. Alabama was part of the Confederacy. A fire glows eternally atop the monument, symbolizing peace in the United States. The gas-fueled flame has burned continuously for 24 hours a day, aside from the energy crisis in the 1970s, and another period when it was electrified. Caption: Top: The north and east sides of the monument. If you want to see the images and words that we have blurred, click on this image. This view was taken facing southwest at approximately 4:45 PM on Thursday, January 8, 2009. Bottom: Another view of the east side of the monument. If you want to see the images and words that we have hidden, click on this image. This view was taken facing west at approximately 4:45 PM on Thursday, January 8, 2009. 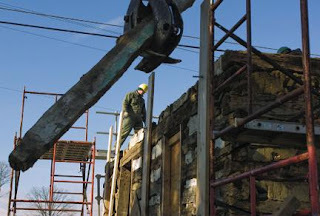 Crews Restore Historic Log House In Gettysburg, Erin James, Evening Sun, January 10, 2009. Jeff Miller takes a look at the mess of a structure in front of him and laughs. 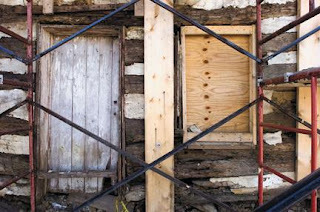 The 210-year-old William Patterson House - what's left of it - is held together by rocks and mud, a combination called chinking. The rest of the house sits in piles scattered around Miller. Then he composes himself to explain his amusement at the sight. "After about 180 years, you really have to think it's time for new stuff," he said. He's not kidding. Gettysburg National Military Park crews are working to restore the house, which is located on the Gettysburg battlefield and dates back to 1798. To do that, they are literally disassembling the structure and then rebuilding it. Miller, a carpenter, was overseeing the project Thursday while workers removed rotted logs, tagged them and piled them on the property just a few feet from the shoulder of Taneytown Road. About 40 percent of the logs are rotted and will be replaced with new wood. But when the structure is re-assembled sometime this spring or summer, it will look almost exactly as it did, Miller said. 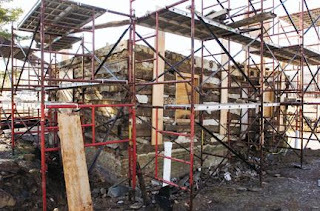 The work began last summer and will likely take a year to complete because of the challenges associated with restoring such an old structure. "This is one of the most extensive restorations we've done in 10 years," Miller said. Historians believe the structure was used as a field hospital during the Battle of Gettysburg and the surrounding property was a pasture at the time of the battle. In 1863, William Patterson owned property on the west side of Taneytown Road, which included an orchard and woods. The farmstead was mostly located behind the Union lines, and the westernmost field extended to Cemetery Ridge and was incorporated into the battle lines of the U.S. Second Corps. The remaining fields, in the rear of the battle line, were used as staging areas, headquarters sites, hospital sites and avenues of approach. According to park officials, the building retains a high level of integrity to the historic period it was built in, and there is a high percentage of original material remaining. The two-story log building was built on a stone foundation and was altered in both the pre- and post-Civil War period. The National Park Service removed non-historic additions to the house in 1982. A modern sprinkler system was also installed in the structure sometime in the last 20 years, Miller said. One of the ongoing restoration project's biggest components was the replacement of the building's foundation, which has already been completed. Once all the logs have been removed from the building, the lumber will be inspected and treated. Any rotted logs will be replaced with new lumber that will look nearly exact - down to the ax marks - like the original. Miller estimated about 40 percent of the structure's logs are rotted. But it could be more, he said. "We'll know better when we get them in the shop," he said. Captions: Top---The last of the logs are lifted off of the second floor of the William Patterson House – the oldest building on the Gettysburg battlefield – along Taneytown Road in Gettysburg on Thursday morning. The National Park Service is working to rehabilitate the house, which dates to 1798. Middle--Parts of the home undergo restoration. Bottom--Scaffolding surrounds the William Patterson House on the Gettysburg battlefield. Victory by Longbow: A famous battle, seen through the eyes of an English archer, A review by Ron Maxwell of Agincourt, Bernard Cornwell, Harper Publishing, 451 pages, $27.99. For every English boy, there is an instant when it's two o'clock on an October afternoon in 1415. The decisive English victory at Agincourt, with the annihilation of the numerically superior French army and the massacre of most of the Frenchmen who had surrendered, was noted by contemporary observers as an epochal event, and rightly so. Even in the context of the punishing Hundred Years War, Agincourt stood out for its brutality, its heroism, its impossible result. It was the sort of event that could only be understood and explained in metaphysical terms. God must have had a hand in its outcome. So they wrote at the time. With the military leadership of the French lying in heaps of bloody and dismembered corpses -- and with the few titled survivors held for ransom in England -- it would take another generation for France to regroup and to reassert its sovereignty and destiny in the person of Joan of Arc. Fourteen years would pass before the French would avenge the humiliation of Agincourt at Patay, a battle in which France's mounted knights, tutored by past mistakes and wary of the English longbow, flanked the English army's archers instead of charging them head-on, as they had at Agincourt. 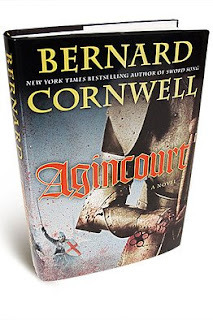 With his novel "Agincourt," Bernard Cornwell leads us into this world with the hypnotic skill of an old seer seated about an ancient campfire. Of course Shakespeare, with "Henry V," has already taken us on this journey, as seen through the eyes of England's young king. Mr. Cornwell selects for his protagonist a man as lowly as the king is exalted, as powerless as the king is omnipotent. By the end of this gripping novel we understand that it was the common soldier -- personified by a man named Nick Hook in Mr. Cornwell's telling -- who embodied the English character and in large measure determined the outcome of its military adventures. Revealing as well is the fact that Hook is exceptionally skilled at a particular kind of warfare -- shooting arrows with a longbow. Anyone who has ever held a bow and arrow will savor Mr. Cornwell's affectionate descriptions of designing, crafting, maintaining, transporting and fighting with this weapon. He emphasizes that it was the English archer who often made the critical difference in 15th-century battle. He was trained from youth to develop the muscles of his arms, chest and back in order to acquire the reserves of strength to repeatedly draw a bowstring that most strong men could barely pull half-way -- and trained as well in the art of guiding the arrow's flight to his prey. King Henry is still central to the historical event, and he is prominent in Mr. Cornwell's novel. Disguised as an anonymous knight, he wanders through the English positions on the night before the great battle. We've been here before, but we're standing on slightly different ground, listening to somewhat different voices. Far from competing with Shakespeare, these scenes offer a quiet and unobtrusive homage to theatrical moments already seared into our collective consciousness. The battle at Agincourt established an English presence in France that would outlast all of its combatants and contemporaries. Mr. Cornwell gives us some perspective for the large historical event by starting his novel more than a year earlier, in the English countryside, where we first meet Hook as well as his nemesis, a leering man of the cloth prone to quoting biblical Scriptures that don't exist but that sound as if they might. A turn of fate accompanied by the voice of a saint compels Hook to enlist as a mercenary in the employ of Burgundy, where he finds himself part of a company of English archers defending a French town then under siege during a civil war among French fiefdoms. To his credit, Mr. Cornwell provides just enough "history" so that we're never in doubt of who's fighting whom or who's on who's side. Whose side God is on (and how can we be sure?) is a more difficult matter for these characters to divine. "Hook often wandered the cathedral [at Soissons]," Mr. Cornwell writes, "staring at the painted walls or at the rich altars decorated with silver, gold, enamel, and finely embroidered silks and linens. He had never been inside a cathedral before and the size of it, the shadows far away in the high roof, the silence of the stones, all gave him an uneasy feeling that there must be something more to life than a bow, an arrow, and the muscles to use them. He did not know what that something was." A few months later Hook, by now something of a veteran, finds himself in the mighty fleet of 1,500 vessels carrying King Henry and his invading army to Harfleur, where they begin a siege of the walled city. In the space of a year, Hook has gone from the besieged to the besieger, from the defender to the attacker. Between the two encounters Mr. Cornwell paints a vivid, harrowing portrait of the ordeal of medieval warfare, with trebuchets, catapults, primitive cannon, vats of boiling oil and crossbow bolts -- even the claustrophobic hell of an underground clash as two tunneling armies collide under the walls of Harfleur. Mr. Maxwell has written a cinematic trilogy on Joan of Arc titled "The Virgin Warrior." He wrote and directed the motion pictures "Gettysburg" and "Gods & Generals." His Web site can be found at www.ronmaxwell.com. Text and Image Source: Wall Street Journal January 22, 2009. Off Topic---Space! The Final Frontier Of Steeler Country! The Space Station is Steeler Country! Off TopicNews---Chemical Weapons Use Found In Syria! 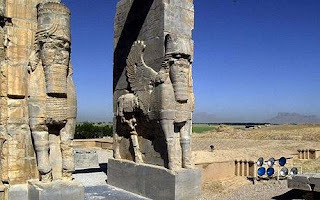 Ancient Persians Who Gassed Romans Were The First To Use Chemical Weapons, The Telegraph (UK), January 14, 2009. Ancient Persians were the first to use chemical weapons when they gassed Roman soldiers with toxic fumes 2,000 years ago, researchers have discovered. Archeologists have found the oldest evidence of chemical warfare after studying the bodies of 20 Roman soldiers. Archeologists have found the oldest evidence of chemical warfare yet after studying the bodies of 20 Roman soldiers' found underground in Syria 70 years ago. Clues left at the scene revealed the Persians were lying in wait as the Romans dug a tunnel during a siege – then pumped in toxic gas – produced by sulphur crystals and bitumen – to kill all the Romans in minutes. Dr Simon James, who solved the mystery, said: "It's very exciting and also quite gruesome. These people died a horrible death. "The mixture would have produced toxic gases including sulphur dioxide and complex heavy petrochemicals. The victims would have choked, passed out and then died. "I believe this is the oldest archaeological evidence of chemical warfare ever found. This is the beginning of a particularly nasty history of killing that continues up to the modern day." Dr James, a researcher at the University of Leicester who presented his discoveries to a meeting of the Archaeological Institute of America, said the 20 soldiers died not by the sword or spear but through asphyxiation. They had been part of a large Roman garrison defending the empire outpost city of Dura-Europos, on the Euphrates river in modern day Syria, against a ferocious siege by an army from the powerful new Sassanian Persian empire in around AD 256. There are no historical texts describing the siege but archaeologists have pieced the action together after excavations in the 1920s and 1930s, which have been renewed in recent years. Evidence shows the Persians used the full range of ancient siege techniques to break into the city, including mining operations to dig under and breach the city walls. Roman defenders responded with 'countermines' to thwart the attackers. It was in one of these narrow, low galleries that a pile of 20 Roman soldiers was found, apparently stacked up neatly and still with their weapons, in the 1930s. Dr James returned to the 'cold case' mystery while also conducting new fieldwork at the site in an effort to understand exactly how they died and came to be lying where they were found. He said: "It is evident that, when mine and countermine met, the Romans lost the ensuing struggle. "Careful analysis of the disposition of the corpses shows they had been stacked at the mouth of the countermine by the Persians, using their victims to create a wall of bodies and shields, keeping Roman counterattack at bay while they set fire to the countermine, collapsing it and allowing the Persians to resume sapping the walls. "But this doesn't explain how they died. For the Persians to kill twenty men in a space less than two metres high or wide, and about 11 metres long, required superhuman combat powers – or something more insidious." Finds from the tunnel revealed that the Persians used bitumen and sulphur crystals to get the fire burning – and this was to prove the vital clue. Dr James believes the Persians placed braziers and bellows in their gallery, and when the Romans broke through, they added the chemicals to the fire and pumped choking clouds of dense, poisonous gas into the Roman tunnel. Dr James said: "The Roman assault party were unconscious in seconds, dead in minutes. The Persians must have heard the Romans tunnelling and prepared a nasty surprise for them. "This is the most likely explanation of how they came to die in such a small space. "There are ancient history texts that mention Greeks using a technique like this against the Romans, using smoke generators in a tunnel, but this is the first physical evidence of this actually happening. "One of the surprising things is that people tend to think these eastern empires were not very good at siege warfare. "But quite clearly the Sassanian Persians were just as good as the Romans." Text and Image Source: The Telegraph (UK) January 14, 2009. Officials at Ford's Theatre have decided not to put on permanent display the embroidered overcoat Abraham Lincoln wore the night he was assassinated in 1865. The theater, on 10th Street NW, had wanted to exhibit the bloodstained coat in a special protective glass case in the lobby, where it would have been visible through the windows 24 hours a day. The coat, its lining embroidered with the phrase "One Country, One Destiny," was to be a signature element of the theater's renovation and the bicentennial of Lincoln's birth next month. 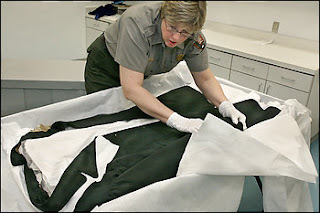 But some textile conservators expressed concern, saying the coat was too old, too fragile and too famous for long-term display. Officials at the theater, which is in the final stages of a $50 million renovation project, now agree. Paul R. Tetreault, the theater's producing director, said the decision was made to display the coat only from the Feb. 11 reopening until April 15. The original will then go back into storage, and a replica will replace it. "What we realized is: To have [the coat] on display constantly, 365 days a year, would be problematic," he said. "We were unaware of the various surveys over the years that the coat had actually been deteriorating. So what we decided is, we really don't want to continue to contribute to the deterioration." But "the public has a right" to see such artifacts, he said. "They own these relics," he said. "The question is, how do you bring them out with the proper conservation and the proper care? And what we determined is . . . we'll display the original coat for the opening of the theater, for the Lincoln bicentennial, up to the anniversary of Lincoln's death, on the 15th of April." It can then be brought from storage for special occasions, he said. Lincoln was shot at the theater by actor John Wilkes Booth the night of April 14 and died the next morning in a boardinghouse across the street. The theater has been closed since August 2007 for the renovation. Among other things, it is getting new heating and air conditioning systems, seats, stage rigging, dressing rooms and elevators, as well as a new control room, gift shop and conference room. Its grand reopening ceremony is set for Feb. 11. "It's going to be terrific," Tetreault said. "It's really going to be great." The following are three reports (January 9 post auction,, January 9 before auction, January 8). Susquehanna Banks will likely take steps to sell the 120-acre club, said Eugene Pepinsky, the bank's attorney. "Banks don't operate golf courses," he said. No bids were made on the 120-acre club, though several dozen people attended the auction. Gettysburg Country Club Comes With Debt Hazard, Erin James, Evening Sun, January 9, 2009. Whoever buys the Gettysburg Country Club today will be acquiring more than a nine-hole golf course. After falling into financial distress last year, the 60-year-old country club racked up a total of more than $3.6 million in debt. The debts range from tax liens to municipal liens to unpaid bank mortgages. The 120-acre property is being auctioned off at a sheriff's sale this morning for a minimum of $2.9 million. "I suspect it will probably be in excess of that in order to get all the costs involved," said Deputy Michael Cook at the Adams County Sheriff's Office, which is facilitating the auction. That's because the buyer will be responsible for all of the country club's outstanding expenses, meaning the country club could ultimately cost no less than $6.5 million. A large portion of the debts the Gettysburg Country Club has incurred likely stem from a significant renovation in 2006 that included the building of a conference room that seats 70, a ballroom that hosts 250 and a pub that holds 60. Authority, $26,661 to Sysco Food Services, $105,998 to Vend Lease Company, $217,890 to the Baltimore Savings Bank, $55,318 to C.E. Williams Sons, $58,977 to the Manufacturers and Traders Trust Company, $17,506 to the Gettysburg Municipal Authority and $85,658 to VGM Financial Services. Gettysburg Country Club is located within the boundaries of Gettysburg National Military Park and was the site of significant action during the Battle of Gettysburg. Cook said the country club's buyer will need to provide 20 percent of the property's price at the auction and the balance within a few weeks. The auction is scheduled for 10 a.m. today at the Adams County Sheriff's Office. Battlefield Not A Buyer For Country Club, Erin James, Evening Sun, January 8, 2009. For sale: A historic war zone, where some of the Battle of Gettysburg's "bloodiest" fighting took place. The 120-acre property comes complete with a nine-hole golf course, new clubhouse and a legacy rivaled only by the battlefield's more famous areas. At least one party is interested in the Gettysburg Country Club, which after falling into financial distress last year will be auctioned off at 10 a.m. Friday at the Adams County Sheriff's Office. But Gettysburg National Military Park won't be placing any bids on the property. Though it is within the park's Congressionally designated 6,000-acre boundary, Gettysburg Country Club is privately owned - which means the park has virtually no say over what the current or new owner does with the land. Park officials had been in discussions with owners of the Gettysburg Country Club, 730 Chambersburg Road, about purchasing a conservation easement on the property that would protect it from future development, park spokeswoman Katie Lawhon said. But those conversations went nowhere, and the park abandoned its efforts to secure an easement through the property's current owners. Assuming that a third party purchases the Gettysburg Country Club Friday, Lawhon said the park would revisit the possibility of an easement. "We would be interested in talking to new owners about it as well," she said. Because of its significance to the battle, the club's 120 acres are named a "high priority" on a list of potential land acquisitions compiled by the Park Service in 1993. "Quite a bit happened out there," said Scott Hartwig, supervisory historian at Gettysburg National Military Park. On the morning of July 1, 1863, Union Brig. 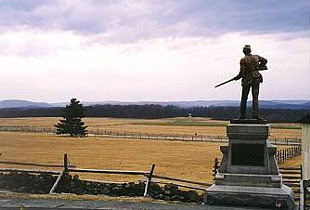 Gen. John Buford's cavalry moved across the area that is now the Gettysburg Country Club and dismounted on Herr's Ridge. Confederate infantry under Gen. Henry Heth drove Buford's cavalry off Herr's Ridge and back across the golf course property to McPherson's Ridge. Later in the day, in pursuit of Buford's retreating cavalry, 1,100 Confederate infantrymen under Gen. James Archer were advancing across golf course property when they were attacked by the famed Iron Brigade. "They were surprised because they didn't anticipate to run into any Union infantry," Hartwig said. It was there that Archer became the first Confederate general captured by Union forces since Robert E. Lee took command of the Army of Northern Virginia. "Archer is probably captured near where some of the buildings associated with some of the country club are today," Hartwig said. By the late morning or early afternoon, the Iron Brigade fell back to a defensive position in Herbst Woods on the west bank of Willoughby Run, along McPherson's Ridge. Meanwhile, on the other side of the country club property, Confederate forces of Gen. Heth's division were forming a strong battle line in preparation for an afternoon attack. What happened next bears similarities to the infamous Pickett's Charge attack that essentially annihilated Confederate forces in Gettysburg. "In a sense, this is the same thing on a much smaller scale," Hartwig said. With some 3,000 men, Confederate Gen. James Pettigrew's North Carolina brigade advanced across the country club property and attacked the Iron Brigade. The North Carolinians came under heavy fire before they reached Willoughby Run, suffering heavy casualties on present country club property. They fought their way across the creek to ground that is now part of the national park and eventually drove the Iron Brigade back. "That fighting there is man for man, probably the bloodiest fighting in the Battle of Gettysburg," Hartwig said. When the fighting was over, the Iron Brigade had lost 1,200 of 1,800 men. Pettigrew's brigade lost close to 1,100. Tomorrow's auction is open to the public. Susquehanna Banks, which foreclosed on the property, is asking for a minimum of $2.9 million. 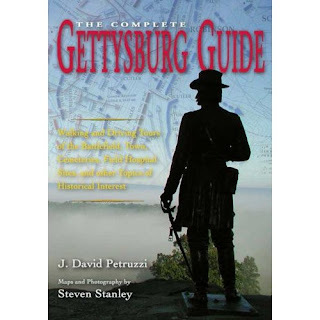 The Complete Gettysburg Guide: Walking and Driving Tours of the Battlefield, Town, Cemeteries, Field Hospital Sites, and other Topics of Historical Interest, J. David Petruzzi, Savas Beattie Publishing, 320 pp, maps, May 2009, $39.95. Some two million people visit the battlefield at Gettysburg each year. It is one of the most popular historical destinations in the United States. Most visitors tour the field by following the National Park Service's suggested auto tour that however, skips crucial monuments, markers, battle actions, town sites, hospital locations, and other hidden historical gems that should be experienced by everyone. These serious oversights are fully rectified in The Complete Gettysburg Guide, penned by noted Gettysburg historian J. David Petruzzi and illustrated with the lavish, full-color photography and maps (70) of Civil War cartographer Steven Stanley. A tour of the various rock carvings on the battlefield, many of which were created by returning veterans and pre-date most of the monuments. 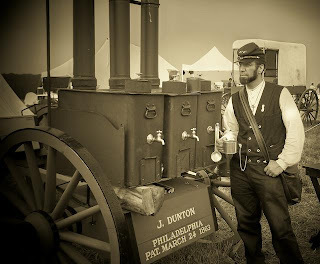 About the Authors: J. David Petruzzi is widely recognized as one of the country's leading Gettysburg experts. In addition to his numerous articles for a wide variety of publications, he is the author (with Eric Wittenberg) of bestsellers Plenty of Blame to Go Around: Jeb Stuart's Controversial Ride to Gettysburg (Savas Beatie, 2006) and (with Wittenberg and Michael Nugent) One Continuous Fight: The Retreat From Gettysburg and the Pursuit of Lee's Army of Northern Virginia, July 4-14, 1863 (Savas Beatie, 2008). Petruzzi is also a popular speaker on the Civil War Roundtable circuit and regularly conducts tours of Civil War battlefields. His website is www.jdpetruzzi.com. Steven Stanley lives in Gettysburg and is a graphic artist specializing in historical map design and battlefield photography. His maps, considered among the best in historical cartography, have been a longtime staple of the Civil War Preservation Trust and have helped raised millions of dollars for the Trust through their preservation appeals and interpretation projects. Steve's maps have appeared in a wide variety of publications. Text Supplied by publisher and author with slight CWL edits. CWL will be pre-ordering this book and pack it for every trip to Gettysburg. Without seeing it yet, The Complete Guide appears that it may be essential for the Licensed Battlefield Guide Exam. On Glory, Gregory J. W. Urwin Professor of History, H-Net, January 7, 2009. This spring marks the 20th anniversary of my working on a Civil War film, Glory, which was distributed by TriStar pictures. 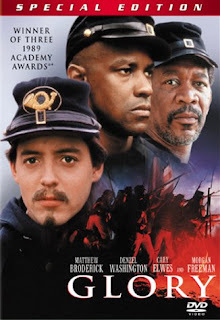 It was a critical success, winning three Oscars(including Denzel Washington's first Academy Award), but only a moderate winner at the box office (because of its focus on a black regiment, the 54th Massachusetts). It sprouted legs on the rental market, however, and many educators took it to their hearts, showing it in part or whole to their history classes. My involvement with Glory played an important part in my education. I functioned as a minor historical consultant and a troop trainer, schooling black extras in William J. Hardee's _Rifle and Light Infantry Tactics_. I also got to command the movie version of Company E, 54th Massachusetts Volunteer Infantry, in the Fort Wagner assault scenes that serve as the film's climax (my company was the one posted closest to the ocean). The reconstructed 54th Massachusetts comprised a representative cross-section of black America -- a body of 200 souls that included professional men from the Washington, D.C., area; university students (including thirteen from the University of Central Arkansas, where I taught at the time); first-time offenders from Arizona sent to work on the film as a form of community service; and street people from Savannah. Throw in 300 white reenactors, plus the requisite army of technicians and stuntmen, and the set frequently teemed with chaos and confusion -- especially since the director had never made a military epic before. I have to admit that Glory turned out far better than I expected. I learned that what the naked eye sees on a set is very different than what a director or cinematopgrapher catcf with the camera lens. I also learned that film-making is very much a group process. The scriptwriter has his vision, and the director, producer, and stars have theirs. In some ways, the situation resembles serving on an academic committee with people possessing fragle, bloated egos and hair-trigger tempers. On a film set, art often takes second seat to box office considerations. There is a lot of money at stake--especially in a big budget war flick -- and the powers that be are more interested in attracting an audience rather than getting every historical detail right. That means aiming for the heart -- as well as the widespread craving for sensational simulated violence. Hence, I tend to judge historical films in the same way that I judge historical novels. In other words, I am willing to grant these cultural expressions a certain amount of artistic license. I believe that I could compile as long a list of Glory's historical inaccuracies as anyone on this listserve. Nevertheless, I am still proud of my involvement in that film. Speaking as a historian, I think Glory got 50 percent of the history right. More important, it captured the spirit and much of the experience of the 179,000 African Americans who joined the Union Army during the Civil War. And it presented a compelling story that helped to acquaint millions of people with a moment in American history in which white and black Americans joined together in a brave effort to broaden the frontiers of freedom. 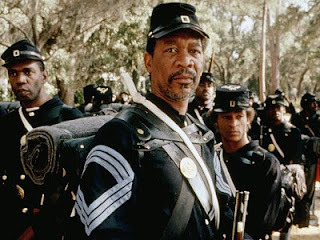 I think those are some of the reasons why Glory has stood the test of time better than films that hewed more closely to the historical record -- such as Zulu Dawn and Touchstone's recent version of The Alamo (an impresssive- looking back but soulless spectacle). In fact, I see a good omen in celebrating the 20th anniversary of _Glory_ in the same year that marks both the bicentennial of Abraham Lincoln's birth and the inauguration of America's first black president. It is yet another case of history being more fascinating than fiction -- a moment of high theater that Hollywood will never be able to duplicate. But for generations to come, historians will be telling our children what it meant to be an American in 2009. They Saved The Union At Little Round Top: Gettysburg July 2, 1863, Ken Dicorfano, Thomas Publications, 128 pp., maps, b/w photographs, notes, index, bibliography, 2002, $11.95. Ken Discorfano in this book expands the popular one word answer to the question 'Who Saved Little Round Top?' Chamberlain plays his part but Discorfano sets Chamberlain and the 20th Maine among the other generals, colonels, and enlisted men who were there that day. Of course, Brigadier General Warren's and Colone Vincent's actions are described; Colonel O'Rourke of the 140th New York plays a major part as does, Colonel Rice of the 44th New York, Private Oliver Norton who was Vincent's bugler,Color Sergeant Andrew Tozier of the 20th Maine, and even Lieutenant Colonel Norval Welch of the 16th Michigan a very small unit that was inadvertently withdrawn during the fight. The author does not limit his story to the 20th Maine on Little Round Top. The 2nd U.S. Sharpshooters' stands on the Slyder Farm, Big Round Top and Plume Run is viewed a setting up the conditions for the Union success on Little Round Top. Company B is credited with drawing 15th and 44th Alabama regiments away from the assault on the west slope of Little Round Top and up onto Big Round Top. Discorfano speculates that the addition of the two Alabama assault to the Confederate on the 16th Michigan, 44th New York, and 83rd Pennsylvania of Vincent's Brigade may have forced the Federal troops of the little mountain. Discorfano describes Company F as troubling the left flank of the 4th Texas during its assault on the west slope of Little Round Top. Discorfano sees Companies A and E as drawing the 44th and 48th Alabama into an weakened assault on Devil's Den. The author also provide satisfactory evidence that the 15th Alabama's canteens were captured by Company B on the southwest slope of Big Round Top. To his credit, Discorfano spends a significant amount of space describing the Confederate leadership, enlisted men and their movements as the Army of Northern Virgina attempts to wrestle the Round Tops from the Federal weak grip. Throughout the book, Discorfano supplies primary sources witness' accounts of combat. The maps have a degree of precision and clarity that always mark the work of NPS Ranger John Heiser. The author refreshingly adds antebellum and postbellum descriptions of the major characters and their wives. O'Rourke's wife became a nun; Vincent's child born two months after the battle dies before its first birthday; Tozier marries after the war and he and his wife become domestic servants in Maine. In the final chapter Discorfano summarizes answers to questions such as 'Where did Vincent Fall? ', 'Did Welch's 16th Michigan run or retreat in good order?' and 'Why didn't the 15th Alabama get a monument on Little Round Top?' among several other issues. A quibble: a brief discussion of the monuments on the Round Tops, the Slyder Farm and Plum Run would have been helpful. A slight quibble: John Chamberlain in the text is stated as being a member of the Sanitary Commission and in his picture's caption he stated as being in the Christian Commission. The picture caption is correct. 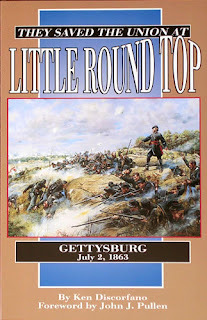 For CWL They Saved The Union At Little Round Top: Gettysburg July 2, 1863, is essential for both the Gettysburg buff and the Gettysburg Licensed Battlefield Guide exam. A 2008 exam question: What regiment was on the right flank of the 15th Alabama during its assault on Little Round Top? Answer: 47th Alabama. A 2006 exam question: How many monuments does the 20th Maine have on the battlefield and where are the location(s)? Answer: There is one monument on each of the Round Tops. James Johnston Pettigrew and His Men at Gettysburg: The Most Promising Young Man of the South, Clyde N. Wilson, McWhiney Publications, 96pp, maps, photographs, 1998, index, selected bibliography,appendix, $12.95. 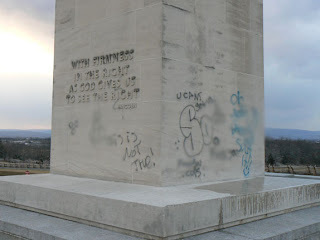 "How I got the nerve to write about Gettysburg . . . I don't know except that my good friend . . . made me do it," the author states in a note at the end of the book. CWL read the note before starting the book and though 'woops, oh no'. Though quickly gleaning the pre-war career of Pettigrew from the book, CWL found that the first 40 pages had been read and there were only 36 more pages to go. Possibly the publisher should have dropped the words 'at Gettysburg' from the title. Wilson, author of Carolina Cavalier: The Life and Mind of James Johnston Pettigrew, adequate condenses Pettigrew's ante-bellum career and supports the reference in the book's title to Pettigrew being among the South's best and brightest young generals. Would that Wilson would have devoted at least another 50 pages to his brigade and his division at Gettysburg. Instead, the book uses 12 pages to cover 1861 to June 29, 1863 and 25 pages from June 30 to July 17. With wide margins, chapters' first paragraphs starting in the middle of the page, and some final pages in chapters having only three lines of text on them, the book has as many as 8 blanks pages which is 10% of the pages in the text portion of the book. The introduction starts on page 13! The text has no notes so readers can only guess where professor Wilson found his information. With the amount of scholarship, even previous to 1998 when the book was published, available on first and third days of the Battle of Gettysburg, CWL wonders why some of the white space in the book was not devoted to text. This reader came away with information and insight on Pettigrew from the book but became disenchanted with it due to the meager information on Pettigrew and his men at Gettysburg. CWL would recommend this book as background reading for high school Advanced Placement U.S. History students but buffs and LBG exam students should invest the two hours it takes to read this book by reading portions of Larry Tagg's Generals of Gettysburg and Bradley Gottfried's Brigades of Gettysburg. 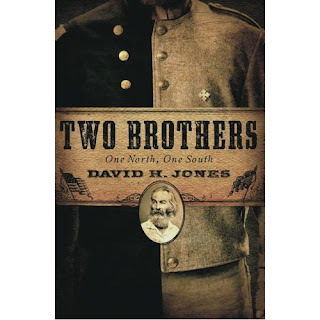 Two Brothers, One North, One South, David Jones, Staghorn Press, 320pp., 2007, $24.95. With a diligent handling of the primary sources and a creative approach, David Jones has crafted a fine story of Maryland brothers who are Civil War soldiers, one in blue the other in gray. With settings in Baltimore, Armory Square Hospital in Washington, D.C, and Virginia's battlefields, the author describes historic events from 1861 to 1865. The story is propelled forward by Walt Whitman who comforted soldiers at the Armory Square Hospital and where, in his post-war recollections, he states that he found two brothers in two different wards: Clifton Prentiss a brevet Union Colonel and William Prentiss, an enlisted Confederate soldier. In Jones' novel, Whitman frequently visits the severly wounded William Prentiss and sits through his passing, and then gathers his two civilian brothers and his wounded brother, who was in the same hospital, together a few days after William's death. In the course of the story, John and Melville tell the civilian side of the war, Clifton the Union side of the war and Whitman the Confederate side of the war as it was told to him by William. Jones faithfully pays attention to the war's social aspects. Friends of the Prentiss family, Hetty, Jenny, and Constance Cary are themselves divided by the war, their friendships and their loves during the war. At one pont on the veranda of Jefferson Davis' White House, the ladies discuss the role of women. The women past through joy and grief at weddings and funerals that held at St. Paul's Episcopal Church in Richmond. The Prentiss family's free black servant, Elijah, leaves his wife and children to become a sergeant in the 7th U.S. Colored Regiment and the war, as viewed by blacks, is discussed around the unit's campfires. The Prentiss brothers are reunited during a Federal assault on the Army of Northern Virginia in the Petersburg trenches. Each is founded within yards of the other; here in the story Jones is not recklessly melodramatic. He has the soldiers act like soldiers and not as Victorian era, post-war sentimentalists. With a writing style that is direct and to the point, Jones handles the myriad of characters well. No one character sees everything nor understands everything. It is in the meeting of the four storytellers that the full story is revealed. There are times though that some characters speak as encyclopedia entries, listing and detailing lives that are tangential to the main story. It is interesting that Union General Benjamin Butler attended the 1860 Democratic conventions (there were three) and voted for the nomination of Jefferson Davis over 50 times, but it doesn't contribute to the main characters development or background story. At times a reader may feel that these characters did not exist outside the story because the events they expierence are so much greater than themselves. An advanced placement U.S. history high school student who loves the Civil War could enjoy this novel as well as most Civil War buffs. Two Brothers does not read like Killer Angels though. Sharra's style, which is similar to Hemingway's newspaperman's writing style, is unlike Jones' more extensive descriptions of individual actions and behaviors. The author's diligence in staying close to the sources and also carefully layering the stories reminds CWL of John Dos Passos' hallmark USA Trilogy: 1919, The Big Money, and the 42nd Parallel. Like Dos Passos, Jones has achieved writing an intriguing tale of the nation and several individuals' stories while allowing the individuals to tell them. John Archer sets out the key elements and effects of the nearly continuous fight for the Bliss Farm on July 1-3. Having lost two sons to western New York state's harsh winters, John Bliss sold his farm and moved his family to Adams County, Pennsylvania in 1857. There within six years he would lose everything except his life and the lives of his family. Located on the west side of the Emmitsburg Pike and opposite of the Brian Farm on Cemetery Ridge, Bliss' 59 acres were in the path of Longstreet's July 2nd assault and the Pickett-Pettigrew-Trimble Assault of July 3rd. 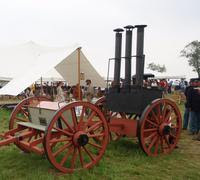 Noting the arrival of Buford's Division on June 30 and Reynold's Corps on July 1st, the Bliss family fled with nothing except the clothes on their backs. Around noon on July 1st the flight was so hasty that a prepared meal was left in the kitchen the homes' front doors doors were left open. Confederate skirmishers were ensconced in the buildings by late evening of July 1st. As Longstreet's July 2nd en eschelon attack rolled from south to north, Wright's Georgia brigade's left wing encountered the Cordori farmstead and pushed aside the 82nd New York, the 15th Massachusetts and Brown's battery. The brigade crested Cemetery Ridge, then forced the 13th Vermont, the 7th Michigan and the 59th New York back. On Wright's brigade(Anderson's division) left, Wilcox's and Lang's brigade were trading volleys with the 1st Minnesota and the 19th Maine. On Wright's right Posey's brigade (Pender's division) engulfed the Bliss farmstead held by the 12th New Jersey. Posey's brigade were nearly fought to a standstill who had turned the the barn and house into a bastion. Though Posey's brigade pushed the New Jersey soldiers out of the farmstead, the Mississippians appeared to be fought out and stayed on the west side of Emmitsburg Road while Wright briefly held a portion of the crest of Cemetery Ridge. During the course of the battle, LBG John Archer states that the Bliss farmstead exchanged hands 10 times. In this respect, the Bliss Farm is quite similar to the Wheatfield which was probably exchanged 8 times. On the morning of July 3rd, the buildings exchanged hands at least twice before Union general Alexander Hays ordered both the barn and the house burned. During the Grand Assault, Brockenbrough's brigade marched past the smoking ruins but also, like Posey's brigade, stopped short of the Emmitsburg Road. John Bliss filed a claim for $2,500 to $3,500 in damages three different times. The federal government turned him down twice because the farm buildings were used by the Rebels. The Pennsylvania legislature passed a bill for the amount to be paid but a check was never written. 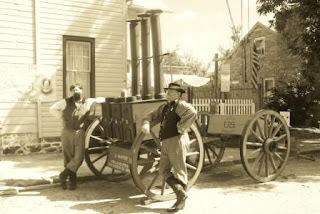 Bliss lost about $2,500 in buildings, improvements, tools, equipment crops, cattle and personal belongs when he sold the farm to Nicholas Cordori for $1,000 in 1866. Archer quotes Bliss as later saying "Let it go. I would give twenty farms for such a victory." The family returned to western New York stay where it maintained a meager existence. Archer recommends Woodrow Christ's book on the Bliss Farm and several articles in Gettysburg Magazine. He notes that the fighting and the importance of the Bliss Farm was generally overlooked until Christ's book, Over a White Hot Crimson Plain, appeared in the mid-1990s. Archer's descriptions include many remarks made by the soldiers. Of course, the viewer would do well to have the McElfresh Watercolor Maps or the Friends of the National Parks at Gettysburg maps handy. 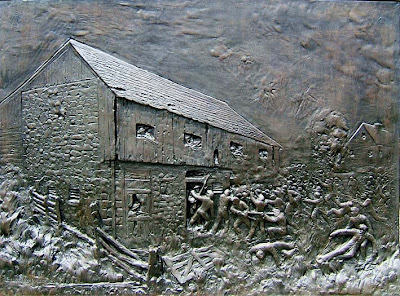 Top Image Source: Brothers' War Relief from the monument to the 12th New Jersey on Cemetery Ridge which depicts one of the Union assaults on the Bliss Farm. Gettysburg National Military Park, Pennsylvania. Bottom Image Source: Gettysburg NMP Virtual Tour, Day Three The Bliss Farm is across the Emmitsburg Road and below the right foot of the 111th New York monument. Note the tip of the roof of the Brian barn at the right of the monument.